You are here: Home / Misc. / Education / Three Silver Linings in The Covington Catholic High Hoax. Three Silver Linings in The Covington Catholic High Hoax. 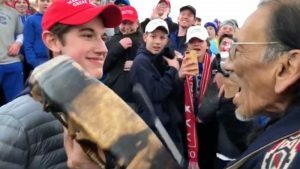 (ThyBlackMan.com) What do you call a group of white high school kids bullied by black adult racists and a Native American activist who lied about being victimized by that same group of white kids for attention? The end of systemic racism in America.